It’s hard to believe 2018 is already coming to a close! The start of a new year always brings new ambitions and goals, in hopes that these things will get accomplished or become healthy habits for the future. 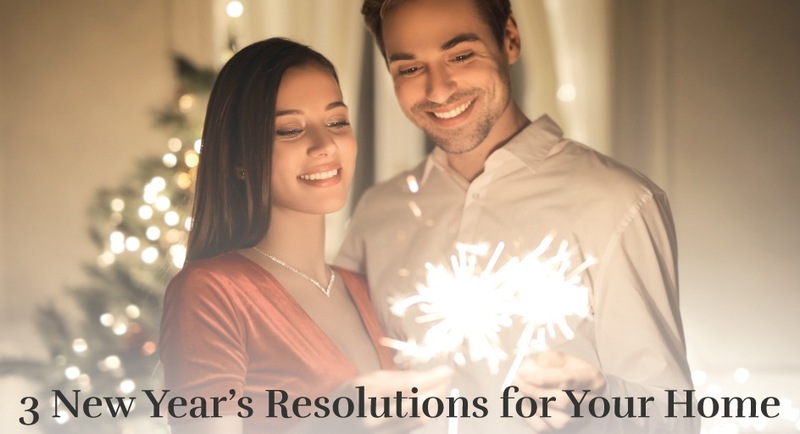 While we’re typically focused on resolutions for ourselves, why not commit to a few that are extensions of ourselves — resolutions for our home. You probably spend the majority of your time at home, following work. Does the new year have you thinking about new projects to take on or ways to make your time spent at home more enjoyable? Below are a few great home resolutions to make for 2017. When it comes to keeping dirt at bay, schedule a time to clean your house once a week. Some tips for a cleaner home include keeping all of your cleaning products in one place, as well as in a caddy so they’re easily transported from room to room. Another thing to keep in mind is that you should only focus on one cleaning task at a time. Most of us start the new year with an accumulation of stuff. And more stuff than we had before. While the cliche saying goes “out with the old and in with the new,” we sometimes forget about the first part. It’s time-consuming to sort, and parting with that old tee shirt we never wear anymore can be harder than anticipated. With that being said, a clutter-free home makes room for the new and provides a much more relaxing atmosphere. Is there a room in your home that you’ve always wanted to change? In order to make the most of the space, it might be time for a renovation. Whether it’s a bathroom, laundry area, or entryway, start by crafting a plan for how you envision the renovated space to look. A renovated space can bring new life into your home.